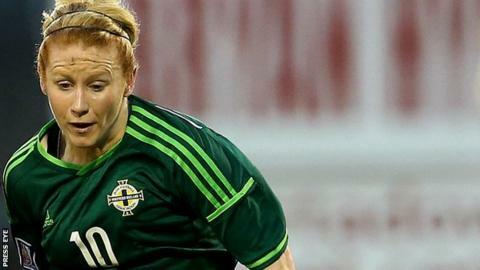 Northern Ireland are still without a goal in their Women's World Cup qualifying group following Thursday's 0-0 draw against the Faroe Islands. Rachel Furness and Lauren Wade both had the ball in the net but saw their efforts ruled out for offside. Afterwards NI manager Alfie Wylie claimed video evidence proved at least one of the goals should have stood. Fifteen-year-old striker Sarah Connolly made her debut and was denied by a great save by home keeper Randi Wardum. The result leaves Northern Ireland with two points from their five matches. They have had a 0-0 draw with Bosnia and defeats by Sweden, Scotland and Poland.